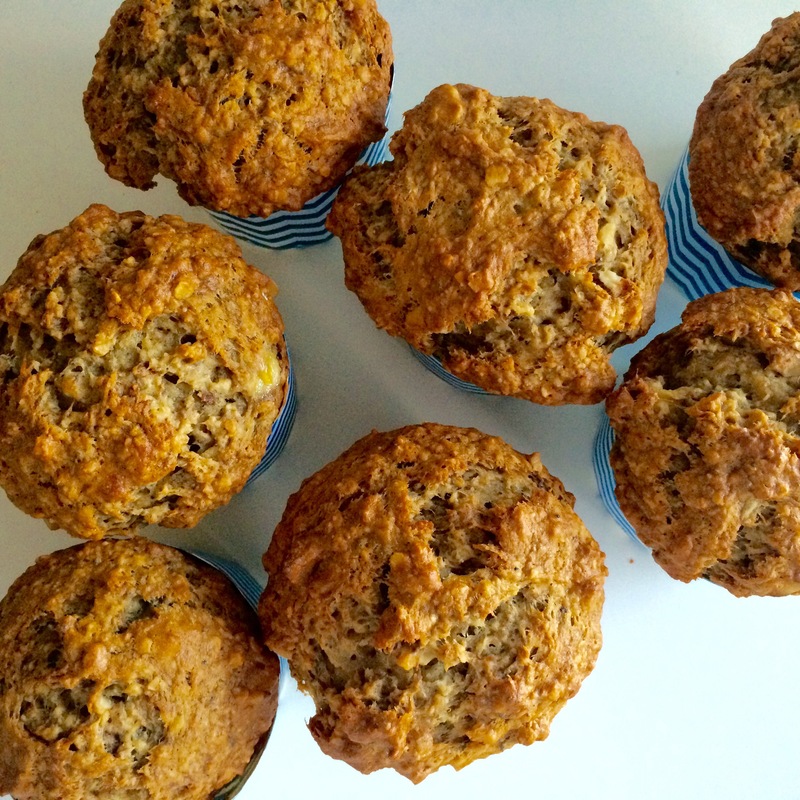 I feel like everyone should have a banana muffin recipe. Whether it’s passed down from your grandmother or you saw something on the food network. It’s one of those recipes that you keep with you and can create over and over again. I always have bananas, and I buy enough to make a smoothie everyday. But there are those days when I don’t have my morning smoothie and by the end of the week I have over ripe bananas that are only good for baking. This recipe has lots of bananas, oats, chia, flax, and walnuts. One could convince themselves that they are healthy except for the flour, sugar, and butter. Nevertheless they are great for breakfast or a snack on the go. In a large bowl, add flour, oats, flax, chia, baking powder, baking soda, and salt. Mix well with a spatula. In another bowl, add brown sugar with 1/2c. water. Mix so the sugar starts to dissolve. Add the bananas. Mash them until they are lumpy, but not pureed. Add the melted butter, egg, and vanilla. Mix well. Make a well with the dry mix. Pour the wet ingredients into the well. With the spatula mix the ingredients together until they are incorporated. Do not over mix. Spoon batter into a lined muffin tray. Bake for 30 minutes. This recipe made 8 jumbo muffins. If you are making jumbo muffins bake them for 40 minutes. These freeze well too. I like to take them out of the freezer and let them come to room temperature then pop them in a 350º oven for 10 minutes.